Populist nationalism is sweeping across the European continent. In the aftermath of the Great Recession of 2008 and human waves of refugees and terrorists washing across Europe, the great post-historical experiment that is the European Union is coming to an inauspicious end. The breakup has already begun. Beginning in 2010, the Greeks and other (mostly) Southern European states were made to feel as second-class members of the EU, since their economies were so burdened by excessive debt. Meanwhile, the Eastern Europeans fretted over the growing Russian threat to their borders, whereas the rest of Europe–particularly in the west and north–braced for the destabilizing effects of ceaseless (predominantly) Muslim immigration into their lands through their porous borders. Historically having been the brainchild of mostly German and French leaders, the European Union has further fragmented with the recent Brexit vote (in response to the destabilizing effects of the EU’s open border policy as well as economic woes). Meanwhile, as far back as 2010, the French were looking to create a sub-regional EU bloc consisting of themselves, the Southern Europeans and North African states, like Morocco (thereby lending credence to Francis Baudel’s claim that Europe’s southern periphery ended not where the Mediterranean Sea began, but rather, where the Sahara Desert ended). The French did this because, in a primarily economic union such as the EU, the French economy is simply not potent enough to warrant the kind of leadership role that they traditionally seek. Once the British left the EU, the Germans became the unquestioned leading state in the EU. Still, as EU High Commissioner, Jean Claude-Juncker, has recently attested, the Brexit vote is killing the EU. Plus, the lackluster economic recovery since the Great Recession of 2008 has only compounded the negative feelings that many Europeans have toward the EU. This has prompted many countries to begin looking at their own national interests yet again, thereby eschewing the globalist concerns of the EU. And, even though the recent Netherlands election did not go the way many observers believed it would (toward the nationalist candidate, Geert Wilders), make no mistake, the nationalist movement is not going anywhere. Looking at the demographics, economic realities, and cultural shifts occurring in most European states, I would contend that it is the globalist, “Eurocrats” whose clock is winding down whereas the nationalists have all of the time in the world. Toward that end, the biggest election in Europe is set to take place in a month’s time. On 23 April 2017, the French presidential elections will take place. As I’ve argued here, Marine Le Pen and her National Front Party stand a very high chance of winning. Indeed, I believe that she will likely be made president. At one point, her fellow Right-wing candidate (the more center-Right candidate, François Fillon) was giving her fits, now he’s fallen by the wayside, and Le Pen’s (centrist in French politics, but a Leftist to most Americans) opponent, Emmanuel Macron, is competing well against her. This shouldn’t surprise anyone: France is a social democracy. An individual like Fillon, despite having previously served as the Prime Minister in the French government, will have a far greater difficulty winning in France because he opposes the Welfare State and is pro-Free Trade. The key to being effective in the upcoming spate of elections will reside in having the ability to accept the necessity of the Welfare State, whilst advocating for greater protections from terrorism and economic malaise. Marine Le Pen fits this billing much better than Fillon, which is why she is a good opponent for Macron. Still, given the fact that the French presidential election system is a two-round event, anything could happen. But, my money remains on Marine Le Pen winning. Meanwhile, as we’ve noted, in Germany, the nationalist Right-wing party, the Alternativ für Deutschland (AfD), is on the rise. It is now the second-most powerful party in Germany, right behind Angela Merkel’s Christian Democratic Party and ahead of the Left-wing Social Democratic Party. Despite being the economic center of the EU, Germany is awash in an immigration crisis brought about by the shortsightedness of Angela Merkel as well as the EU’s open border policy. The AfD’s platform is almost universally centered on anti-immigration sentiment. Of course, they’ve added more issues onto their party’s platform, but that was the core of the AfD. It’s what most Germans associate with it. And, it’s what a great many Germans ostensibly agree with. This Far-Right German political party was once the laughing-stock in German politics. But, now, between the ongoing economic crisis and the growing disruptions caused by the influx of immigrants, especially refugees fleeing the Syrian Civil War, the AfD Party has become the third largest party in Germany’s government. Plus, their popularity is on the rise, since embracing a wholly anti-Islamic party platform. The longer the refugee crisis persists in Germany, the greater the popularity the popularity for this party increases. And, as it increases, so too will its political power. On top of being anti-Islamic, this party is rabidly anti-EU. Should they gain an increased level of power, akin to what happened in Great Britain during Brexit, we can expect to see some form of European disintegration, as Germany reduces its commitment to the EU. In each case, the nationalists have been seen as having ties with Russia. Recently, Marine Le Pen met with Russian President Vladimir Putin. The AfD has oddly chosen to intensify relations with Russia (though their relationship is nominal, compared to Le Pen’s). Also, Nigel Farage of UKIP has praised Putin as being “mature” (as opposed to the Russophobic Left). Then, of course, there is the completely overblown Trump-Russian connection that the American Left continues spewing. While it is not impossible that Russia is manipulating these actors, what is more likely is that the Russian leadership has sensed a drastic paradigm shift in the politics of the West and is moving in to capitalize on them, by currying favor with this new set of leaders. These new leaders, mind you, have for most of their careers been on the outside-looking-in on the political systems in their countries. They are therefore happy to upset the apple cart, as it were, not only out of a desire for implementing truly innovative policies, but also as a means of exacting revenge upon those domestic actors who prevented them from becoming a part of the ruling elite. Russian President Vladimir Putin met with AfD Party leader Frauke Petry in February of 2017. French Presidential candidate, National Front Party leader Marine Le Pen (left) meets with Russian strongman President Vladimir Putin. Photo courtesy of TIME Magazine. Much like what happened in the United States, the nationalist wave in Europe was the most blatantly obvious event to occur in recent history. Of course, to the foreign policy graybeards in the West, the election of Donald Trump, Brexit, and the other nationalist movements represented a black swan event. Yet, these trends mirror closely the drastic shifts that have been occurring in international economy, foreign policy, and in demography for the last 25 years. Rather than being an unanticipated event, then, we should be wondering how the people who pay attention to these issues for a living so completely missed these events. And, while Western analysts may have written the Right-wing nationalist and populist movements as “fringe,” Russian policymakers certainly did not. Thus, these nationalist movements–particularly in Europe–are not the product of Russian influence operations. Rather, they are entirely organic (hence, populist), they were entirely predictable to any objective observer, and they represented the kind of Hail Mary play that Putin needed after his disastrous foreign policy choices these last nine years. You see, while Russia is the strongest it’s been since the end of the Cold War, it is still incredibly weak. The proliferation of “Fake News,” the bizarre diplomatic arrangements with the crazies in Tehran, the sycophantic fawning of China, the modernization of their nuclear forces, and the kowtowing to European (and, potentially, American) Right-wing nationalist parties is all part of Russia’s last great play before having to call it to quits and lose even more of its international power. Vladimir Putin is a skilled Judo master. Judo is a form of martial arts. Not unlike wrestling here in the United States, Judo is a test of wills; victory in a match belongs to the fighter who has mastered the art of good timing. In Judo one is locked into a physical battle of stamina and strength. To win, the fighter must wait for that moment when his opponent has a momentary lapse in his fighting technique, allowing for the fighter to maximize his advantage with a rapid attack that overwhelms his adversary. There is no grand plan going in (other than to win by outlasting your opponent). Putin looks upon global politics in much the same fashion. So, while this nationalist sweep in the West is likely not a product of Russian intelligence, Putin is smart enough to realize that he stands to gain mightily from the new politics arising in the West. Why does Russia benefit the most from these changes? Because under successive governments in Europe and the United States, a consistent policy of keeping Russia at arm’s length, and vacillating between open opposition to Russia or a complete disregard for Russian goals and interests has been the standard operating procedure. Putin has hope that this new group of European nationalist leaders might take a different approach. When Vladimir Putin arose to power in the late 1990’s, many in the West were optimistic that he would prove to be the effective reformer that his predecessor, Boris Yeltsin. could never have been (good ole Boris liked Vodka and corruption far too much). In all fairness, there seemed a period (for but a few years) where Mr. Putin was genuinely interested in making Russia an official member of the West. But, the West could never get its act together. It could never really overcome the Cold War mentality that had defined its existence for 50 years. Plus, Russia did not behave as a nation interested in conforming to the standards and values of the West; it continually sought to straddle the line between becoming a full member of the West’s club and being its own entity. Now, after 17 years, the Russians have clearly decided to try and have their cake and eat it as well. You see, until the Russian invasion of Crimea in 2014, there was real talk of a new economic bloc existing that would sweep from Lisbon in the EU to Vladivostok in the Far Eastern section of Russia. But, after the Russian actions in Ukraine, these dreams died–at least for most Western leaders. The dream for Russia did not die. Mr. Putin simply changed the Parameters: he would create an alternative model whereby all roads led to the Kremlin from Lisbon to Vladivostok, and it would be called the Eurasian Economic Union. The EU is essentially a dead man walking. NATO’s efficacy is (understandably) increasingly being called into question. And, with the loss of these two international organizations, American reach will be greatly diminished. Of course, given that America is home to the world’s largest economy and, seeing that there are strong cultural bonds between the U.S. and Europe, this Russian gambit might not prove as effective Putin prays that it is. 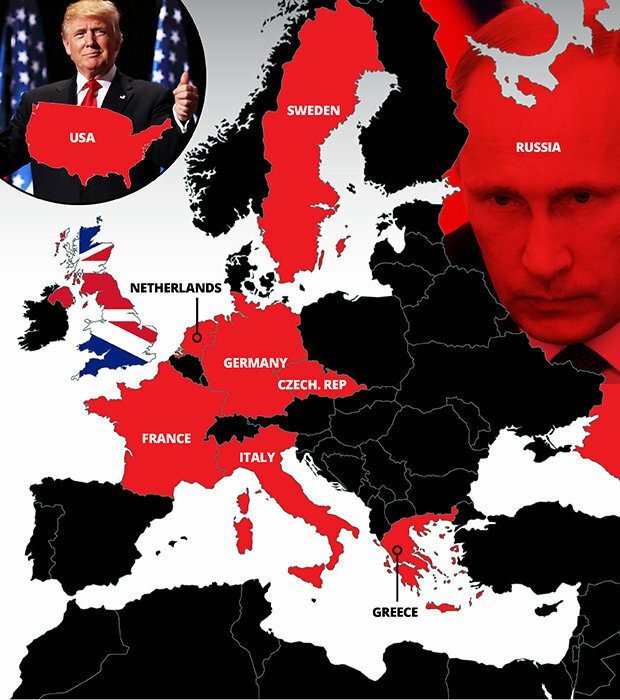 Nevertheless, on paper at least, the dissolution of NATO and the EU and the reordering of European politics to be closer to Russia means that the U.S. will be pushed out of Europe. Still, though, Le Pen, the AfD, and those supporting Brexit (as well as a slough of other nationalist parties throughout Europe) seem quite pleased to cozy up to Russia. Remember: during the 2010 Greek Debt Crisis, Russia was very seriously thinking about bailing Greece out. Had they managed to do that, Putin would have accomplished what his Soviet forbearers failed to do in the opening days of the Cold War: make Greece a Russian proxy state. It would have also opened up Russian naval access to the Mediterranean, and allowed them to further destabilize the Middle East (as well as Europe). Of course, this did not happen (and Russia was not responsible for the Greek Debt Crisis), yet, Mr. Putin almost took advantage of the crisis for his own gain. The reason that he did not ultimately go through with it, according to Bloomberg, was likely because bailing Greece out and getting them out of the EU wouldn’t “ensure access to any lucrative assets” and the Tsipras government was not stable enough. Of course, less reputable news organizations, such as ZeroHedge, claimed that Putin backed away from seeking to bail Greece out of the EU as a means of gaining political leverage over Germany’s Angela Merkel. While it is true that Russia highly values its relationship with Germany, I disbelieve this notion. I simply think that Putin didn’t see any tangible gain to the move (though, such a move more than his ham-fisted invasion of Crimea, might have accomplished his goals far better in the long-run). Vladimir Putin (left) and Greek Prime Minister Alexis Tsipras. Why would the Europeans, regardless of which side of the political spectrum they happened to fall on, want to move away from America’s orbit and into the creepy embrace of their traditional enemy, Russia? As Robert Kagan outlined in his two books on the subject, “Of Paradise and Power,” and “The Return of History and the End of Dreams,” these negative trends were compounded by the fact that the United States insisted on footing the bill for European defense. This acted as a sort of subsidy for the European states (particularly our friends in Western Europe) to focus on making money for themselves, ballooning up their already bloated entitlement systems, and spending gobs of money (that should have otherwise gone toward defense) on Leftist social experiments. The results for Europe have been pretty dismal and explain why populist nationalistic parties are winning. Times are bad now economically, divisions on the continent are more pronounced. And, with the loss of the sense of security, Europeans are looking for a way to return to history. Plus, America’s policies in the Global War on Terror (specifically Enhanced Interrogation Tactics and the Iraq War) as well as the Great Recession of 2008 (and its aftermath) have driven Europeans farther out of America’s orbit. These two events opened up the transatlantic divide and have made possible the erosion of the EU, the weakening of NATO, and the slight European turn toward Russia. Speaking of history, while most people today only remember the Cold War and the Red Scares that dominated that period, most forget that several European states were historically quite friendly with pre-Communist Russia. France and Germany consistently had positive relations. So too did Germany during the Interwar years, the Russians allowed German arms producers to build factories and construct new weapons that ultimately went into the creation of Hitler’s war machine). In fact, it was the Germans who, in World War I, funded and provided transport for Lenin and his Bolshevik Revolution in its early days. Today, both France and Germany have, at various points, worked well with Russia. Also, from a straight political and military perspective, Europe is a shadow of its former self. Rather than being Russian stooges, many of these European nationalist leaders would cozy up to Russia simply as a means of having greater geopolitical influence in the same way that most European leaders (particularly Western European leaders) became involved in the EU. For the French in particular, it’s a necessary return to classic geopolitics. It truly is a return of history. (From left to right): German Chancellor Gerard Schroeder, Russian President Vladimir Putin, and French President Jacques Chirac formed an unbreakable tripartite alliance against the U.S. in opposition to the Iraq War. As George Friedman outlines in his 2005 epic work, “America’s Secret War,” in the run-up to the Iraq War in 2003, the French, Germans, and Russians secretly conspired to undermine the George W. Bush Administration’s diplomatic efforts for building a coalition to war against Iraq. More recently, thanks to Russia’s natural gas stores, much of Europe is dependent on Russia–especially Germany. Now, today, both Germany and France are run by Russoskeptics, but given the proximity of Russia to their borders, the natural gas ties, and the Russian military threat, the Germans and French in particular feel that they have no choice other than to work with Russia on certain issues. Should Euroskeptical populist leaders arise in places like Germany and France, it is likely that Russia would find a great deal of stability in its relations with Europe. Indeed, it is more than likely that the frostiness between the two parties would thaw. Leaders like Marine Le Pen, or leaders from the AfD in Germany, could be instrumental in lifting the stringent sanctions that were imposed upon Russia following its annexation of Crimea in 2014. In fact, as I’ve noted elsewhere, it is the German-led European sanctions upon Russia rather than even America’s sanctions that are seriously damaging the Russian economy. Yet, given the size of trade between Europe and Russia, it is likely that the sanctions upon Russia are negatively impacting the EU economy, and therefore, encouraging greater separatist sentiment from the nationalists throughout Europe. The Trump Administration has already expressed interest in lifting sanctions on Russia. Should populist-nationalists win out in Europe, they could very well also lift sanctions on Russia. In fact, in a perverse way, the nationalists who lift sanctions on Russia in Europe might actually breathe some new life in the ailing EU. After all, the EU economy has had a sluggish recovery, every bit of trade would help. Russo-European trade would grant Eurocrats a reprieve from decline. Still, I doubt my globalist friends would view it this way. They’d rather talk endlessly about trite conspiracy theories and find Russians under every bed. The Left’s newest tactics are akin to the Red Scare, only without the Communists. And before my Rightist friends jump down my throat, let me just state that stabilizing relations with Russia, while fraught with dangers, is not the worst policy course to take for the West. Far from it. In fact, the worst possible policy is what we’ve been doing thus far. The alienation of Russia has not made the world better. It has made everything worse. The West does indeed share interests with Russia–notably in fighting jihadists. Of course, the West also has a great many disagreements with Russia. But, for now, let’s table these in favor of confronting the absolute evil that the world is facing from the Wahabbī and Salafi terror groups in the Middle East. Second, no one benefits from Russia becoming a Chinese vassal state which is precisely what it happening (even if Putin doesn’t realize it). Third, there is simply no benefit to pushing Russia toward collapse which is precisely what the West has been doing with these sanctions. As for the sanctions: I fully acknowledge that Russia needed to be punished for its actions, that a military confrontation initiated by the West is unlikely to occur, and that the sanctions have been very effective. However, the sanctions have had the perverse effect of harming American allies in Europe. Furthermore, they’ve driven the already paranoiac Vladimir Putin into greater depths of anti-Western beliefs (i.e. his full on embrace of Alexander Dugin’s Neo-Eurasianist concept). The less prosperous the economies of both Russia and Europe are because of reduced trade between the two of them, the more unstable and insecure the world is made. Besides, allowing for Russia to collapse would likely loose its vast (and now modernized) nuclear force onto to the international illicit arms black market, where any terrorist, rogue state, or weirdo can purchase a Russian nuke (think of the opening scene from James Bond: Tomorrow Never Dies). So, there you have it. It’s true, Russia stands the most to gain (in the near-term) from the rise of Right-wing populist-nationalist leaders in the West. Yet, that hardly implies that these Western nationalists are Russian stooges. It likely just means that Vladimir Putin sees a once-in-a-lifetime opportunity and is taking it. Already, we have seen that President Donald J. Trump (supposedly a Russian plant) has turned tough on Russia over Ukraine. Why would a Russian agent of influence do such a thing? Even still, though, the nationalists in the West also see an opportunity to buy much-needed time for their declining states. In the case of Europe, they are directly threatened by jihadism and economic malaise. Increased, positive relations with Russia can help them on both counts. Vladimir Putin with Iran’s leader, Ayatollah Khameini. Putin really thinks he can control the millenarian Mahdīs who run Iran. For the U.S., America’s economic situation is tenuous at best. While we need to maintain our global dominance, we need to also reassess our commitments. Relaxing tension with Russia would alleviate much of our burden. Meanwhile, like Europe, we have mutual interests in taking out the jihadists plaguing the Middle East. We also need to counterbalance with China, contain Iran, deal with North Korea, and end America’s war in Afghanistan. Russia can help us with all of these issues. Even if we cannot agree on Iran, for instance, the fact is that we can generate enough goodwill by fairly and respectfully engaging with Russia on some of these other issues that it might create the conditions necessary for Russian assistance in ratcheting down the threats posed by, say, Iran. So, yes, the EU is dying, nationalism is on the rise in the West, and the Russians stand the most to gain from it. That’s not all bad, though.